I have been absent for a few days, in part because I've been busy with the unusual task of translating an interview Mr. Asao did earlier this year in the Swiss St. Galler Tagblatt -- which has required using not only my German skills, which have gone unused for some time now, but also translating my English translation into Japanese, because no one else in the office can read English. It is an exhausting task, but I think it's actually turned out pretty well, so far. 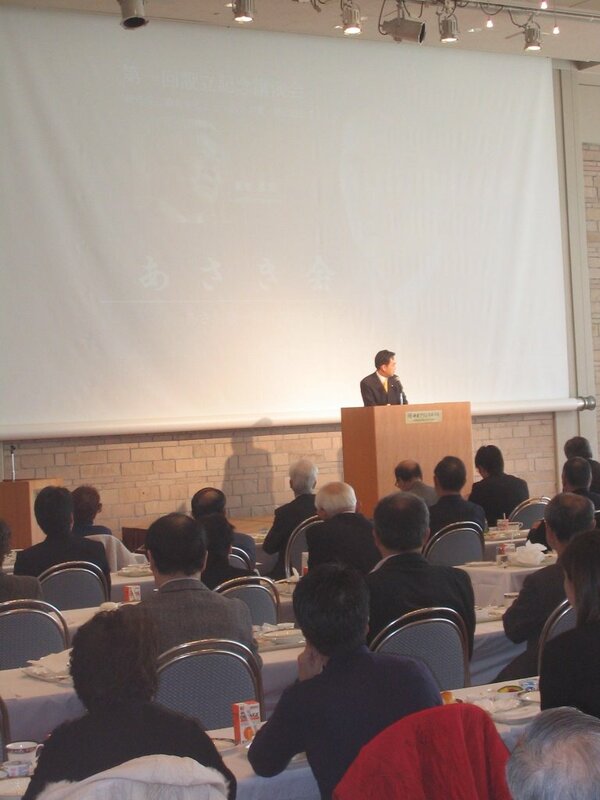 On Friday, Mr. Asao hosted a fundraising breakfast at the Kamakura Prince Hotel. The breakfast was attended by approximately 220 people; there were actually more attendees than there were places. The keynote speaker was a noted scientist, who talked about current issues in Japanese politics and praised Mr. Asao. In other words, it was a pretty standard political fundraiser. That's one thing I've learned here: in advanced democracies, there are only so many ways for politicians to communicate with constituents, and vice versa. While Japan is lagging behind somewhat in its adoption of e-campaigning techniques -- beyond official websites there's not much use of digital tools -- I have yet to see an approach that I have not also seen used in the US. At the same time, however, the spirit of Japanese democracy is very different from American democracy. Personalities seem to matter much more here than in the US. Personality is, of course, important in American politics -- John Kerry might have been president now if it wasn't important -- but personality shares precedence with party and policy. In Japan, however, party and policy trail personality. So campaign flyers highlight the candidate's personal history and details alongside policy positions. I think this is, in part, a product of Japan's party system. If American democracy represents a(n) (American) football game, with two more or less clearly defined teams fighting back and forth continuously, each with its own fervent supporters, Japanese democracy has long resembled a Harlem Globetrotters exhibition, with the LDP in firm control of the "game" like the Harlem Globetrotters, with a beleaguered opposition -- the Socialists during the cold war, the DPJ more recently -- playing the role of the hapless Washington Generals, keeping things interesting but never actually controlling the agenda. When the LDP was briefly driven from power in 1993, observers thought that the "Harlem Globetrotter" days of Japanese democracy might be at an end. But the LDP returned, weakened, but still in command. The creation of the DPJ in the late 1990s by castoffs from all parties in Japanese politics, including a number of short-lived parties created during the political upheaval of the 1990s, was similarly hailed as a sign that Japan might develop a more balanced two-party system. To date, however, the DPJ has been disappointing, having suffered from leadership difficulties and internal conflicts as a result of being a party stitched together by politicians of all stripes. Like the LDP, it has pretty much been a vehicle to elect individuals grouped under a big tent party, with no guarantee that those individuals share policy ideas. There are signs, however, that this divisiveness in the DPJ may be at an end. One sign was the selection of Ozawa Ichiro as DPJ president earlier this year. Ozawa, whatever his failings, is a crafty political veteran and a committed reformist -- and an advocate of a strong two-party system in Japan with clear differences between the two parties. Now it seems that Ozawa has set about clarifying exactly what the DPJ stands for and how it differs from the LDP. Ozawa has, with the help of a nine-member panel, set about drawing up a platform that, it is hoped, will resolve once and for all where the DPJ stands on a range of issues. The party will try to finalize a draft by year's end, as party competition heats up in advance of the 2007 Upper House elections. Both Asahi and Yomiuri saw this as important enough to merit editorials (English version of the Asahi editorial here). Whether Ozawa's effort to enforce policy discipline on the DPJ will succeed is unknown. It may be impossible to enforce discipline on a party that includes dedicated socialists as well as hawkish Young Turks like Maehara Seiji and Nagashima Akihisa. If the DPJ is to emerge as a legitimate contender for government, something like this is necessary because until the parties become true transmission belts for competing visions of how to govern Japan, there is little incentive for voters to abandon the LDP. Japan needs -- dare I say -- more partisanship. The competing parties must be seen as the guardians of clearly defined positions, which inspire loyalty from blocs of voters, instead of random assortments of politicians sharing a common banner but little else. A little partisanship may actually lead to better, more accountable government, instead of the cozy, clubby Kokutai system that produces behind-the-scenes compromises in the Diet. Partisanship may seem at odds with this customary way of Japanese decisionmaking that emphasizes steady, bottom-up consensus-building, but without going to the partisan extremes that the American political system has gone (Washington could probably learn some lessons from Japan), Japan could benefit from some degree of partisanship without completely abandoning government by consensus. Of course, for this to happen the way Japanese citizens approach politics will have to change; this may be the biggest obstacle to reform. It seems to me that while Japanese voters are well informed -- based on the political coverage on TV and in the mass-circulation dailies (and I mean mass; the Yomiuri Shimbun, for example, has 14.5 million subscribers, the most of any paper in the world) -- they are, unlike Americans, hesitant to voice their political opinions. Japan is more a spectator than a participatory democracy. Unless Japanese voters become more willing to express approval or disapproval and participate in politics, broader change in the Japanese political system is unlikely. There are some signs that Japan may be moving in this direction -- take, for example, the growing presence of NGOs -- but ultimately the cultural change that will facilitate political reform cannot be decreed. And cultural changes take a long time to wend their way through society.